Kellogg�s recently introduced versions of their Frosted Flakes and Froot Loops cereals with 1/3 less sugar than their respective original versions. The time seems right as all of America is currently going ape-crazy for a whole new breed of diet fads. From the perspective of breakfast institute � where a chief aim is to find a balance between good taste and good health � the idea seems long overdue. I reviewed the new cereals by comparing them to the originals and comparing the new cereals to one another. Frosted Flakes and, to a slightly lesser degree, Froot Loops could be called breakfast cereal classics � cereals who�s flavors are forever familiar to anyone who grew up with them. Both of the new cereals maintain the core of their flavors. That is to say, most anyone who knows Tucan Sam and Tony The Tiger, would know what they were eating even if the taste of the 1/3 less sugar versions seems slightly askew. The new Froot Loops is entirely similar to the original. The reduction in sugar is hardly noticed � most likely because the flavor depends as much on imitation fruit as it does on sugar. The new Frosted Flakes didn�t fare as well. Almost to be expected, the cereal that was once called "Sugar Frosted Flakes", has an altered taste when much of the sugar is removed. It�s a testament to the original Frosted Flakes that you might be inclined to add a Tablespoon of sugar to make the new cereal taste better. Many good props to Kellogg�s for their attempt to make these classic cereals healthier. One hit and one near miss isn�t too bad. 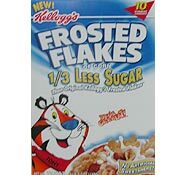 What do you think of Frosted Flakes - 1/3 Less Sugar? 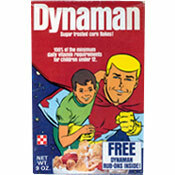 I have just purchased a box of 1/3 less sugar froseted flakes for my family, crazy why any one wouldn't these days. I wonder if Kellogs anticipated me (or any consumer for that matter) having an original box along side the "new" box. I was amazed to find there are more calories in the 1/3 less box. Well sort of. They have upped the "per serving" from 31g to 33g or 3/4 cup to 1 full cup. Sodium up 60mg and of course starch up 6g. And we all know what starch is broken down....sugar!! Iam not saying the cereal isn't enjoyable, I buy it and occasionally I eat it, I just wonder why companies can't be more honest with us instead of us coming to find them to be liars and boycotting their products. Look at Buckleys for instant...have they EVER told you it tasted good! Anyhow, just a mom of three wondering what others think when they pick up a box claiming to be less fat just to find out they really mean..."Just look on the front of the box, the section we can lie on but stay away from the side info panel"!! !